It's always fun to see what employees of Research In Motion do outside of the company as side projects. Recently the Senior Vice President of Design at RIM, Todd Wood, was selected by The Interior Design Show (IDS) to design a new version of the iconic "Julian" chair by Magis. Todd wasn't the only designer chosen, and in fact was one of 20 renowned designers from all corners of the globe that were chosen to put their own spin on a chair, each of which was auctioned off January 26th with proceeds from the auction benefitting the ONEXONE non-profit children's foundation. The organization is committed to improving the lives of children in the U.S., Canada and Haiti and focuses on 5 sectors that are essential to children’s overall well-being: Water, Hunger, Healthcare, Education and Play. Todd’s design, “PowerPup,” takes the original design of the chair a step further by integrating the ability to charge your smartphone. His interpretation of a redesigned “Julian” chair allows this dog-shaped chair to now “fetch” and charge a BlackBerry Bold 9900 smartphone in its mouth. Todd and his team are responsible for the look and feel of BlackBerry branded smartphones, tablets and accessories. Todd’s award-winning work has been exhibited at the Museum of Modern Art in New York City, and also featured on two different postage stamps commemorating Industrial Design in Canada. Additionally, RIM joined forces with RADO and the Ontario College of Art and Design University (OCADU) to explore the concepts of time and communication by two future-oriented and iconic brands. Results of a semester long course, mentored by marketing experts from RADO and designers from BlackBerry, will be showcased at the RADO Exhibit at the Interior Design Show 2012. To learn more about the design projects, see the press release after the break. January 26, 2012 - Toronto, ON and Waterloo, ON - Through collaboration between RADO, BlackBerry® and the Ontario College of Art and Design University (OCADU), third year Industrial Design students were invited to explore the concepts of time and communication by two future-orientated and iconic brands. 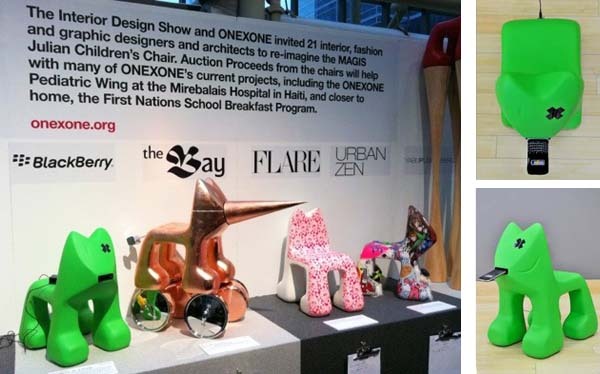 Results of a semester long course, mentored by marketing experts from RADO and designers from BlackBerry, will be showcased at the RADO Exhibit at the Interior Design Show 2012. RADO and BlackBerry joined forces in this initiative as a result of their shared commitment to supporting young design talent through education and real world experience. Participants designed and developed a concept for future products (excluding watches and smartphones), service, item of packaging, constructed environment or other medium, which reflects an innovative spirit, and the unique expression of both brands combined. The students were encouraged to push the boundaries of time, communication, mobility and luxury. The project presented an excellent opportunity to design for a global audience, guided and coached by design experts from RADO and BlackBerry. “This opportunity provided by BlackBerry and RADO exemplifies the drive in OCADU to give industrial design students the opportunity to work with “real world” clients, to imagine what the future might look like, and to demonstrate what the next generation of great Canadian designers can do” said Julian Goss, Assistant Professor at OCADU. To see the submitted designs visit the RADO Exhibit at the Interior Design Show 2012.